If you get the box of puff pastry dough the day before, thaw in the refrigerator overnight. Otherwise, let it sit on the kitchen counter for 3-4 hours to thaw. To accelerate thawing if it’s still not ready, CAREFULLY unfold the dough so it is a flat sheet, still in the plastic wrap, and wrap with kitchen towels. I would not recommend thawing via microwave. 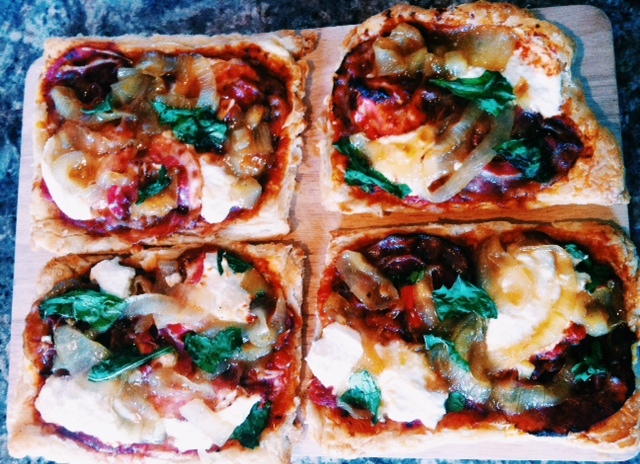 While the dough is on the tail-end of thawing, get your toppings ready! Chop up some fresh basil to put on the pizza, and set aside Heat some butter in a frying pan and cook the pancetta. Keep it on medium-high heat and make sure to pay attention, as each side of the pancetta takes only about a minute to cook. Remove from pan and set aside. Next, mix together your honey and dijon mustard in a bowl. There should be equal parts honey:mustard, but feel free to taste and add to your liking. 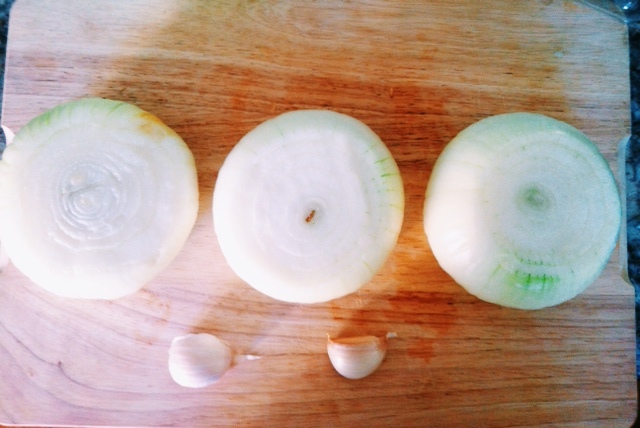 Slice the onion(s) to about 1/4 inch thick, and place in a bigger bowl. Toss the onions in the honey mustard mix and let sit for a few minutes. Heat up a pan on medium heat, throw in some butter, and add the onions and the leftover mix. Cover and let cook down for about 15-20 minutes, or until onions are soft. Make sure to stir occasionally so the mixture doesn’t burn or stick to the pan. The smell of these bad boys will undoubtedly get your mouth watering. Once finished, set aside along with the pancetta and basil. Once the puff pastry dough is thawed, place on a baking sheet. An important note, and thankfully one that I called my all-knowing mom about, is to bake the dough about halfway through before you put any toppings or sauce on it. This ensures the dough cooks evenly and is stable enough to hold ingredients. Following the baking directions on the box, set the oven to the appropriate temperature, and bake for half the time. Remove from the oven, and spread on sauce. Add pancetta, onions, basil, and dollups of ricotta cheese evenly on the pizza, layering the ingredients as necessary. Bake in the oven for the remaining amount of time. Make sure to check the pizza intermittently so the crust does not burn. If it starts to darken, remove from the oven and cover those areas with aluminum foil so you can continue baking. Once dough is cooked and cheese is molten, remove from the oven and serve!! This works for 2-4 people. If you’re a duo, which I was with a favorite dining companion, then I suggest you be HUNGRY. Enjoy! Surprisingly, the air conditioning in my turn-of-the-century home has been functioning so efficiently that I forget it’s probably over 90 degrees outside. Both soup and a molten grilled cheese are normally associated with a brisk fall evening or a snowpocalypse, but I say NAY to stereotypical seasonal restrictions! Wrapped in a cozy blanket basking in the AC, I recently dined on the most indulgent and delicious grilled cheese I’ve ever had. 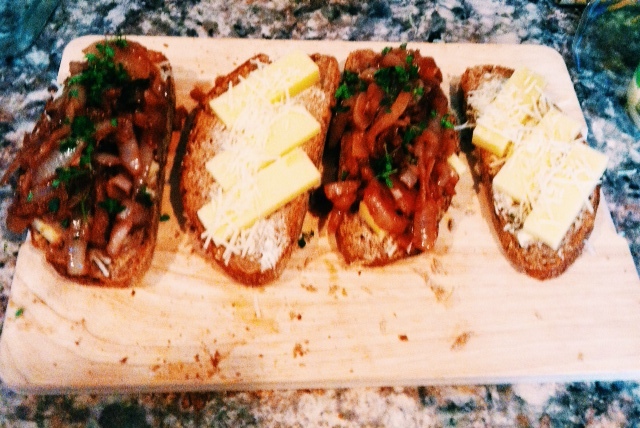 I’m a huge fan of French Onion soup in general, so when I found a recipe for incorporating the same concept into a SANDWICH, I knew it had to become a reality ASAP. Pro tip: make sure you’re starving. 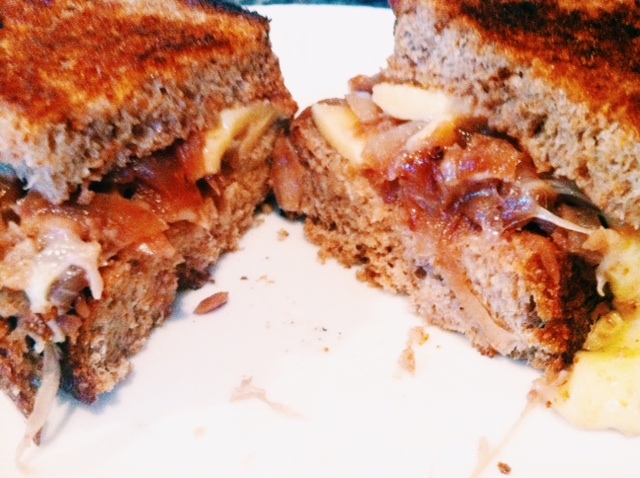 Grilled cheeses are pretty straight forward and cheap, but this recipe calls for an additional preliminary step of braising a bunch of delicious onions. Your grocery list should still be very reasonable. Assuming you have olive oil, butter, and some wine, your list is basically garlic cloves, onions, bread, cheese, and thyme. Cut the onions in half lengthwise, then slice thinly again lengthwise. 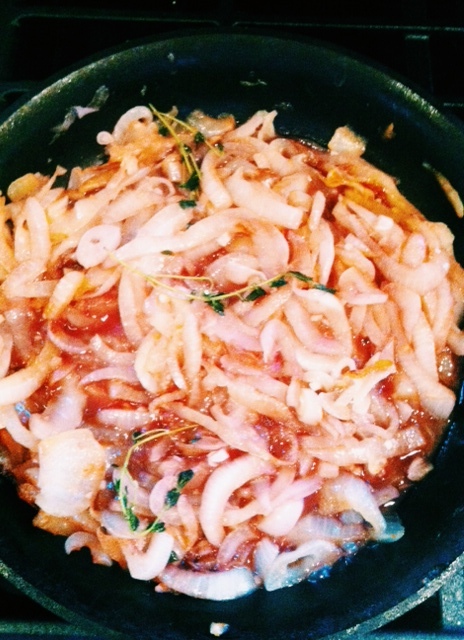 For every 1 large onion, heat about 1 teaspoon olive oil in a large, heavy-bottom pan over medium heat. Add the same amount of butter, allow to melt, then add minced garlic. Allow the garlic to soften (but not color), then add the onions. Stir to coat the garlic and onions in oil+butter, add a bay leaf and a small sprig of thyme, then turn down the heat to medium low (so onions don’t burn). Continue to cook the onions until they are soft and deep golden brown, 30-40 minutes (depending on how many onions you cook). After this point, add about ¼ cup red or white wine (again I suggest red for some pretty coloring), and allow to cook down with the onions, another 5-7 minutes. The intoxicatingly rich smell of these bad boys is enough to get your mouth watering. Once finished, set aside for grilled cheese assembly. Spread each slice of French bread with softened butter, both sides. Add half the shredded cheese to one, pile braised onions on top, sprinkled with fresh thyme leaves, salt and pepper, then add the rest of the cheese. Close the sandwich with the other slice of bread, and gently press together. 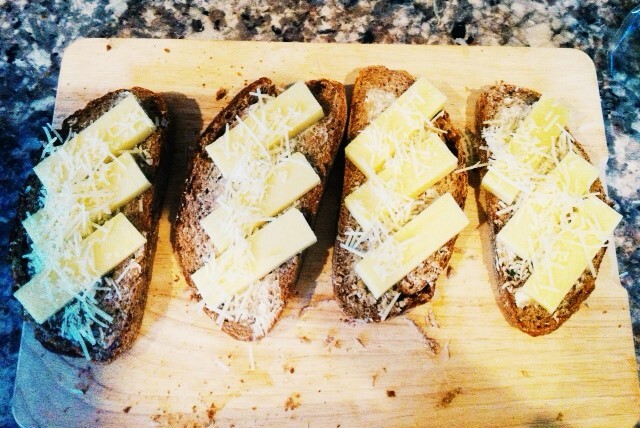 Pictured is the sliced gruyere cheese and some fresh parmesan, because why not. Add grapeseed/olive oil into a pan, then add butter and turn on high heat. 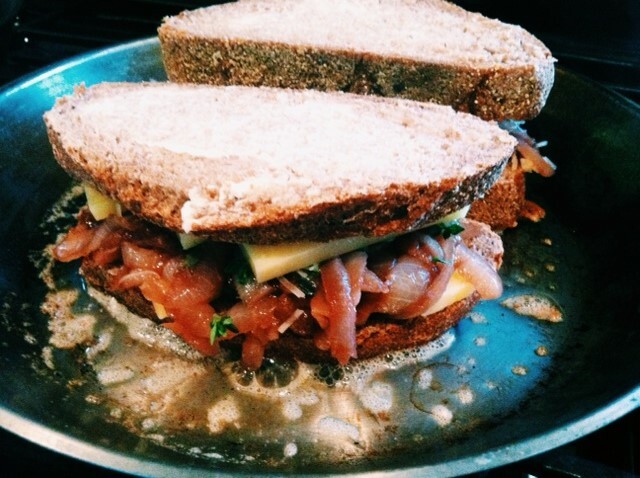 Place sandwiches in the hot pan and cook until cheese is melted and bread is golden brown on both sides. WARNING: flipping these things is a feat. I ended up needing a spatula, tongs, and another set of hands. Good luck…. KEEP YOUR EYE ON THE PRIZE! Put on some stretchy pants and enjoy this summer indulgence because frankly, life’s way too short not to.